I’ve tried many iPhone cases. Leather ones are certainly my favourite, and the Access Case doesn’t fail to impress. There are most definitely plenty of leather wallet cases available, but this one is my favourite. It’s nearly perfect down to the last stitch. 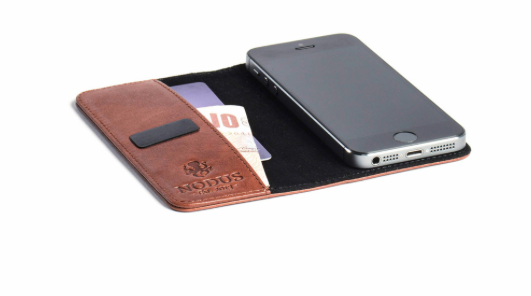 The Access Case is a stylish leather case created by Nodus. It began as a Kickstarter project and is now available for iPhone, iPad and Samsung Galaxy. The review unit received was Chestnut Brown, but it also comes in Ebony Black. By using micro suction technology the creators managed to keep it ultra slim while still providing sufficient protection. The case uses this bond not only to keep the phone secured, but also as a latch to keep it closed. The best part? No residue. There are certainly many pros to the case. Starting with the packaging, the case arrives in a sleeve not so different from those covering your Starbucks cup. An information booklet is tucked into the wallet part of the case describing how to clean the suction pads and secure the phone. At first I was skeptical about the use of sticky pads to keep my phone safe, but I’ve had no problems with it. Somehow the pads aren’t sticky to the touch yet still manage to keep the phone tight. I really enjoyed having the additional padding to keep the case closed. Leather cases notoriously keep bent open until the leather is broken in. The break-in time for this case? Less than two days. Even the logo on the inside fits perfectly with the feel of the product. No case is perfect, but this one comes pretty close to. My main concern was when putting the phone on for the first time, it’s hard to line it up with the camera hole. I was met with bad memories of screen protectors gone horribly wrong. It took two or three times to get it right, but the phone came off no problem without the micro suction pads losing suction. Additionally, when using the card portion I found that the case didn’t close properly. I only managed to fit a couple cards and some cash in. Compared to my BookBook, this was disappointing. The Access Case is a beautifully crafted leather case. Every case has its own unique look due to the genuine Italian leather used. As long as you don’t plan on using this case to replace your entire wallet you will certainly find it well worth the £59.99. I highly recommend. 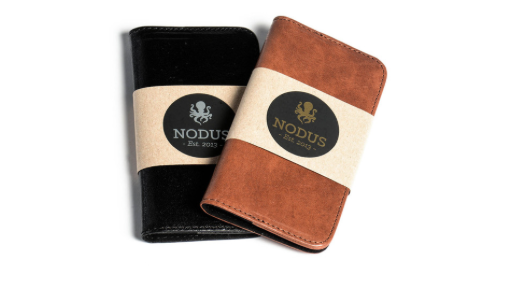 The folks over at Nodus were kind enough to give us a second case to giveaway! Head over here for details.